<p /> <a href="http://www.ecouterre.com/eileen-fisher-extends-commitment-to-sustainable-fashion-social-responsibility/">Eileen Fisher</a> would like its clothes back, thanks very much. In honor of Earth Month, the venerable womenswear label is rolling out its not-for-profit <a href="http://www.ecouterre.com/recycle-your-gently-used-eileen-fisher-clothes-support-womens-and-girls-causes">"Green Eileen Collection Program"</a> at all of its retail stores nationwide. Participation in the initiative, whose proceeds support women's and girls' groups, is easy: Simply drop off any gently worn Eileen Fisher clothing at any of its retail locations and you'll receive a tax receipt and $5 in "Recycling Rewards" per item for a future purchase. To kick off the program, as well as toast the upcoming openings of two <a href="http://www.ecouterre.com/recycle-your-gently-used-eileen-fisher-clothes-support-womens-and-girls-causes">Green Eileen</a> stores in Seattle and New York City, Eileen Fisher is launching its <a href="http://eileenfisherampersand.com/How-you-can-recycle-our-clothing">"We'd Like Our Clothes Back Now, Thanks Very Much" campaign</a>. Its first order of business? Power-washing various sidewalks with <a href="https://inhabitat.com/reverse-graffiti-san-francisco/">reverse graffiti</a> messages that read <a href="https://twitter.com/search?q=%23thxverymuch&src=typd">#thxverymuch</a> to drive awareness of the project through social media. 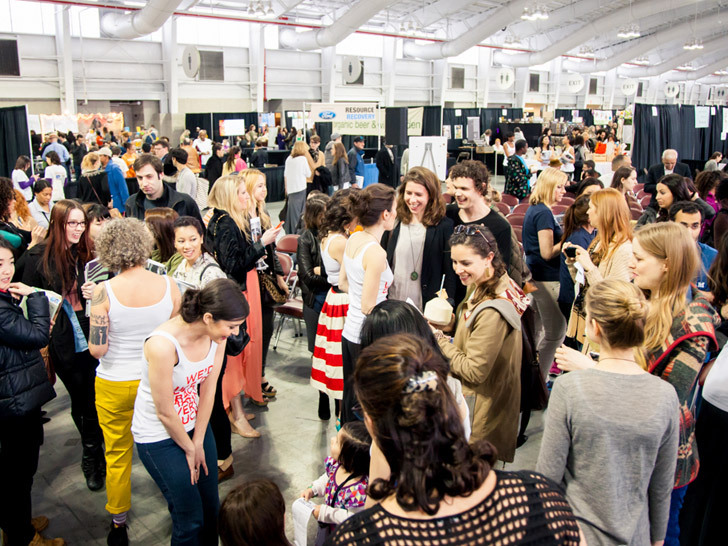 <p /> <small>Photo by <a href="http://dancutrona.com/">Dan Cutrona</a></small> <p /> At New York City's <a href="http://www.greenfestivals.org/nyc">Green Festival</a> on Sunday, Eileen Fisher, with help from "eco-fashion conspirator" <a href="http://www.amydufault.com">Amy DuFault</a>, also hosted a mini-fashion show featuring looks from its sustainable collections. <p /> <small>Photo by <a href="http://dancutrona.com/">Dan Cutrona</a></small> <p /> The models—designer <a href="http://www.ecouterre.com/carrie-parry-talks-about-winning-green-fashion-competition-future-plans/">Carrie Parry</a>; writers <a href="http://www.ecouterre.com/greta-egan-founder-of-fashionmegreen-columnist-style-blogger">Greta Eagen</a>, <a href="http://toutlemon.de/">Jessica Marati</a>, and <a href="http://pastfashionfuture.com/">Emma Grady</a>; "one-woman army" <a href="http://www.ecouterre.com/eco-fashion-by-sass-brown-a-definitive-guide-to-sustainable-design/">Sass Brown</a>; makeup artist <a href="http://greenbeautyteam.com/">Kristen Arnett</a>; and Ecouterre's <a href="http://www.amandacoen.com">Amanda Coen</a> and <a href="http://www.ecouterre.com/author/jasmin/">Jasmin Malik Chua</a>—weren't your typical clotheshorses. <p /> <small>Photo by <a href="http://dancutrona.com/">Dan Cutrona</a></small> <p /> But they each spoke about their passion for sustainability in fashion, along with the importance of living mindfully. 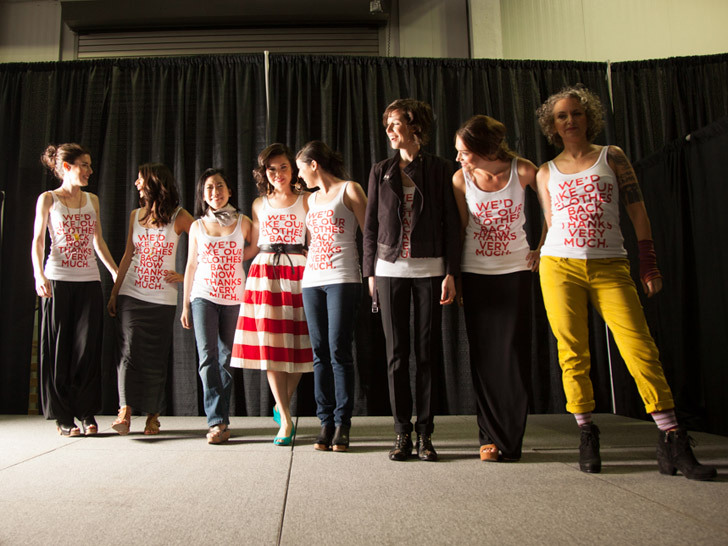 <p /> <small>Photo by <a href="http://dancutrona.com/">Dan Cutrona</a></small> <p /> For their curtain call, the group reemerged in matching "We'd Like Our Clothes Back Now" organic-cotton tank tops to draw attention to the initiative. <p /> <small>Photo by <a href="http://dancutrona.com/">Dan Cutrona</a></small> <p /> But Green Eileen and its garment-take-back program aren't just a way to channel funds to female-empowering organizations like <a href="http://www.girlsinc.org/index.html">Girls Inc.</a>, the <a href="http://www.nywf.org/">New York Women’s Foundation</a>, and <a href="http://www.womenforwomen.org/">Women for Women International</a>. <p /> <small>Photo by <a href="http://dancutrona.com/">Dan Cutrona</a></small> <p /> The initiative also seeks to highlight the importance of examining a <a href="http://www.ecouterre.com/levis-is-offering-10-grand-for-the-most-innovative-air-drying-solutions/">garment's life cycle</a>—from the harvesting of its fibers to its <a href="http://www.ecouterre.com/why-does-end-of-life-management-matter-in-fashion-design/">final disposal</a>—in its entirety. <p /> <small>Photo by <a href="http://dancutrona.com/">Dan Cutrona</a></small> <p /> Having its garments molder in a landfill isn't something that appeals to Eileen Fisher. 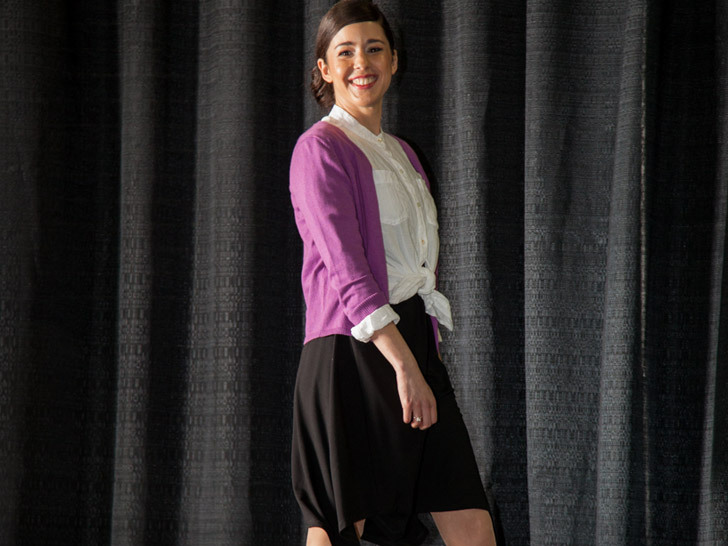 Longevity and versatility are key tenets of the label's design philosophy, according to Cheryl Campbell, managing director of the <a href="http://efcommunityfoundation.org/">Eileen Fisher Community Foundation</a>, the altruistic arm of the company that manages the Green Eileen initiative. <p /> <small>Photo by <a href="http://dancutrona.com/">Dan Cutrona</a></small> <p /> Eileen Fisher clothes are "worn for many seasons and do not fall into the <a href="http://www.ecouterre.com/how-do-we-break-our-fast-fashion-addiction-an-interview-with-overdressed-author-elizabeth-l-cline/">'disposable fashion'</a> category," she tells Ecouterre. <p /> <small>Photo by <a href="http://dancutrona.com/">Dan Cutrona</a></small> <p /> Should you tire of them, however, Green Eileen's goal is to give those clothes a second or even third life. <p /> <small>Photo by <a href="http://dancutrona.com/">Dan Cutrona</a></small> <p /> Still, all good things must come to an end. <p /> <small>Photo by <a href="http://dancutrona.com/">Dan Cutrona</a></small> <p /> When the time comes when they're no longer suitable for wearing, Campbell says their usefulness can be extended as children's clothing, rugs, and other items. <p /> Customers can even help repurpose those pieces through hands-on workshops held at the Green Eileen store in Irvington, NY. 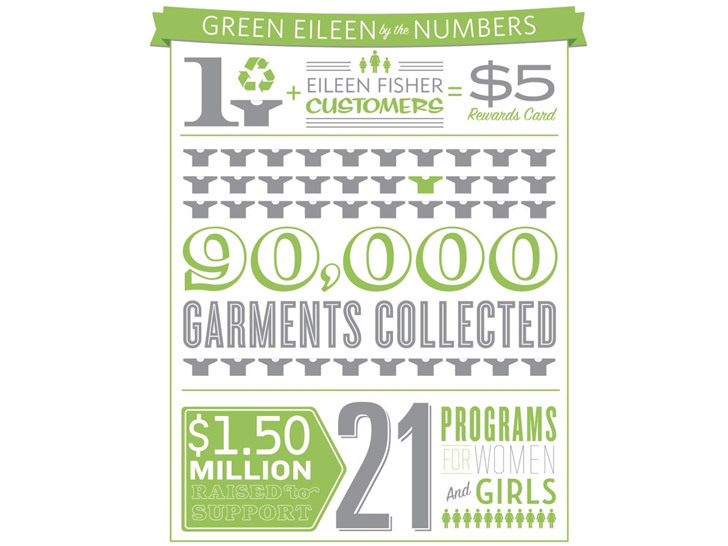 <p /> To date, Green Eileen collected over 90,000 garments, raised $1.5 million and supported 21 organizations that improve the lives of women and girls in local, national, and global communities.